Gale Waldron’s long-held dream of a public mural in Leesburg finally will come true. A passionate leader and supporter of public art in Loudoun County, Waldron, who died Jan. 7 after several years combatting cancer. She planned her final arts campaign last October with almost military precision—tapping long-time friends and allies to help her bring it to conclusion. 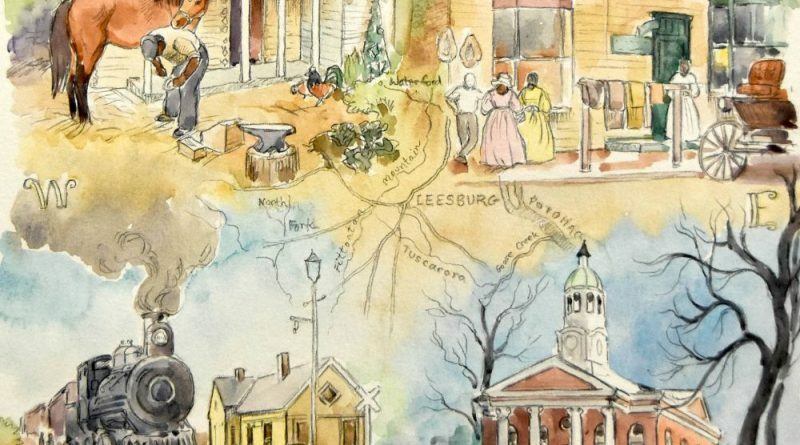 After endorsements from the town’s Public Arts Commission, Board of Architectural Review, and the Leesburg Town Council, the mural detailing Leesburg’s long and rich history will be installed on the south-east wall of the town parking garage near West Loudoun Street. The town will hold a formal ribbon-cutting ceremony during the April 21-22 Leesburg Flower & Garden Festival. The artwork has been gifted to the town by the Waldron family. The idea of a public mural for Leesburg had been in Waldron’s mind for a long time, dating to the days when she was the director of Gallery 222 on South King Street. “She always had a vision for ‘walls’ where others just saw a wall,” her husband, Gerry, recalled. But, that idea never went anywhere because the town’s Board of Architectural Review at the time had no regulations or guidelines by which it could be judged. “This is a totally different concept,” he said. Waldron put together a team of trusted friends—artist Penny Hauffe, former colleague and artist Dana Thompson, longtime Leesburg BAR member Tracy Coffing, and attorney Mary Gayle Holden. Her husband was the cheerleader throughout. Thompson, who had worked under Waldron when she was the director of Gallery 222 and later at ArtSquare on Cardinal Park Drive, said Waldron had been “cooking this in her mind” for some time—from her hospice bed at home. “This is her legacy. I’m so proud of the way she handled everything,” Thompson said, noting Waldron was fully involved in the project right to the end. 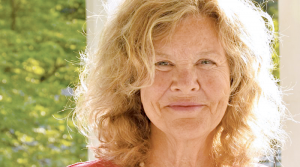 Coffing took on the role of public spokeswoman and liaison with the town. She had experience with town staff from her days serving on the BAR. An attorney, Holden’s task was to work with the town to make sure all the legalities were observed. At the end, all of the members were proud that they had brought Waldron’s wishes to fruition. “We honored her vision,” Coffing said. At their first meeting on the project, they discussed vague concepts applicable to Leesburg’s history. Over the next weeks, the concept was refined until it detailed the story of the town from its founding in 1758 to the 1960s. The 8-foot-by-8-foot mural is composed of two panels topped by a smaller scroll with text. Hauffe finalized the design four days before Waldron died. Hauffe aims to finish the murals by April 4. They will be installed by Quail Run Signs of Hamilton. Architect Tom O’Neil, who has headed the seven-member Public Arts Commission since 2014, believes the mural is a good fit for downtown. Any art on buildings or in public spaces in Leesburg has to be approved by the commission, and the panel voted unanimously on Jan. 22 to accept the project and accept it as a gift to the town. The BAR discussed the mural earlier this month and suggested the south-east wall as the perfect spot. As the final step, the Town Council unanimously approved the plan last week. Noting his wife’s “determination” to get it done, Gerry Waldron said he and his family “are proud of her and so excited.” He said if he could see his wife’s face, it would have a look of great happiness.